The Papyrus section of the Austrian National Library (die Papyrussammlung in der Österreichischen Nationalbibliothek), previously the Papyrus Erzherzog Rainer, holds a collection of 68 textiles (inventory numbers A.L. 1-71). Some of these textiles have writing on them, others do not. Other textile items incorporate recycled paper in their structure, a specific interest of A. Regourd. The collection is expected to be published in French in two volumes as part of the Austrian National Library collections. The team would like to warmly thank Prof. Bernhard Palme, Papyrussammlung, Österreichische Nationalbibliothek, for his constant support and his kind help. 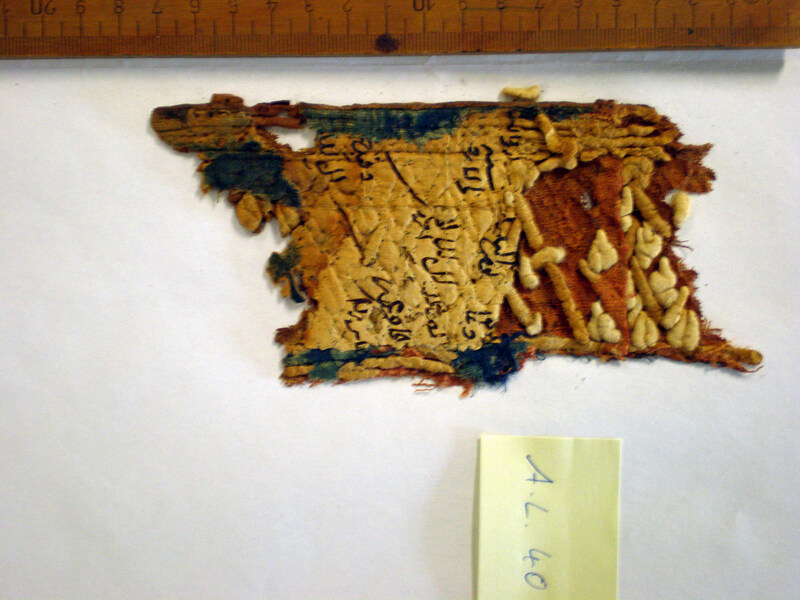 March 2009 = Anne Regourd (AR) has her first contact with the textile collection AL in the Papyrus section of the Austrian National Library (ANL, Papyrussammlung des Österreichische National Bibliothek), during the Conference of the International Society of Arabic Papyrology (ISAP) which took place in Vienna and decides to organize a project. Autumn 2009 = AR approaches Fiona Handley (FH) and Lucian Reinfandt (LR) and invites them to participate in the project of Research and Publication of the AL textiles. In addition to his personal role in the frame of the project, LR kindly agrees to liaise between the Project and the ANL. March 2010 = AR comes to Vienna in order to see all pieces of the collection in the frame of a mission from the CNRS, UMR 7192, in Budapest. June 2010 = FH comes to Vienna in order to see all pieces of cloth in the collection. September 2011 = AR comes to Vienna in order to work on the collection in the frame of the Program of the Papyrus section of the ANL. October 2011 = the collection is digitized at a high resolution. CNRS, UMR 7192, ” Proche-Orient – Caucase : langues, archéologie, cultures “, http://www.digitorient.com/. February 2012 = LR sends his contribution in German to the project on the reconstruction of the history of the collection, as well as an extensive bibliography. April 2012 = LR’s contribution in German having been finalized, next step is its translation into French, the language which has been chosen for the publication. Mai 2012 = FH delivers the entries of 1-35 of the cloths of the AL collection in French. June 2012 = Question adressed to Cécile Bresc (numismatist) by AR on the hypothesis that some pieces of cloth could have contained coins. July 2012 = Money is secured for the translation of LR contribution into French, thank to CNRS, UMR 7192. May 2013 = it has been decided to publish the AL collection in one volume –and not in two fascicules as planned initially. 1-26 June 2013 = mission at the Center for Textile Studies, Copenhagen, Denmark. September 2013 = FH delivers the entries 36-71 of the cloths of the AL collection in French. September 2013 = translation of the contribution of LR in German translated into French. Autumn 2013 = Susan Day provides her approval of the technical vocabulary of the descriptions in the French version. 13 November 2012 = AR, “A logo system? Mediaeval Texts on textiles from the Austrian National Library, Papyrus Dept”, “Name and be named. Writing names in Judaeo-Arabic, Arabic and Hebraïc manuscripts”, 4th Doctoral Day organized by the students in Paleography and Hebraïc Diplomatic, EPHE, Paris, Institut National d’Histoire de l’Art (INHA), 13.11.2012. 13 June 2013 = AR, talk focused on 10 items of the AL collection, at the Centre for Textile Studies, Copenhagen, Danemark. 8 October 2013 = AR, ‘Islamic Textiles from the Austrian National Library (Arabish Leinwand collection): a micro-economy’, Third Biennial Conference of the Society for the Medieval Mediterranean, Churchill College, ‘Trade, Travel and Transmission in the Medieval Mediterranean’, Cambridge, GB. http://www.societymedievalmediterranean.com/conference-2013-1.php. 19 June 2014 = AR & FH, “A Name of a Workshop on a Piece of Textile: the Case of the Document A.L.18 (Vienna)”, International Conference, « Textile terminologies from the Orient to the Mediterranean and Europe – 1000 BC – AD 1000 », 18-21.06.2014, Copenhagen. http://www.mae.u-paris10.fr/arscan/Textile-Terminologies-from-the.html.